It was a dark, rainy, and stormy night…..oh, no…wrong time of the year!! Twenty meters was hopping and there were some strong stations and I quickly got them in the log. 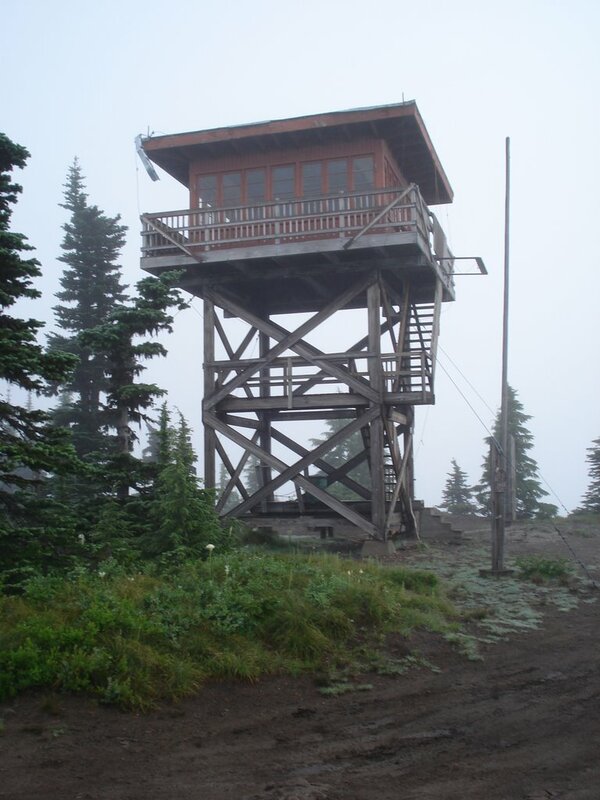 And then the DISRUPTION…..a young couple hiked into the tower site for the scenic views….unfortunately (or fortunately depending on your “viewpoint”) she was clad in a tight-fitted, sweat-soaked, T-shirt. Pamela Anderson, eat your heart out! My CQ’s became unintelligible…I was only sending gibberish. I had to stop…to get my bearings…..and breath again. I ripped my earphones off, jumped up, and explained to the inquisitive young lady (and her boyfriend…was he there?) what we were doing, putting on my “best” ham radio ambassador hat! After the short discussion, they left and I sat down to a cool Pepsi drink and to let my blood pressure come down. Where am I? What was I doing? Oh, yeah…the contest! We both ground out a number of contacts on 20m and 40m. The bands seemed “reasonable” and I worked a number of west coast stations which were surprised at my “NJ” state but they were copiable and we got through the exchange. We switched antennas about 2-1/2 hours into the FOBB just so Glen could experience the phased-beam. Near the end of the FOBB, we were both “cooked” and more than ready to get out of the sun. It didn’t take long to disassemble, pack up, and hike down to the pickup. Already we have plans for next year’s FOBB…what great stories will emerge? 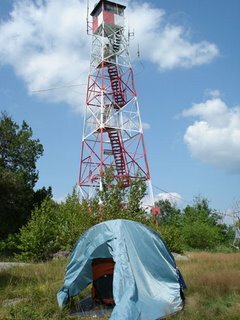 I arrived about 8am and quickly set up a dipole center supported from the 30’ high firetower and the ends supported by nearby trees. Unfortunately, the weather was warm (low 50’s) but the mountain was encased in clouds. The light mist wasn’t heavy enough to “rain” but certainly the humidity was 100 percent! 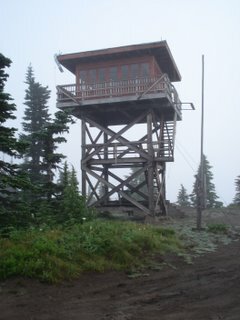 To the east there is a 500-800 foot drop off (according to the topo maps!) so my 5w Elecraft K1 signal was enhanced! My first 20m qso was with a “local” in Salem. I had a previous qso with Vern, AA7VW, from the AT in NJ so it was a small world. This time my signal was a good 579 and we had an enjoyable qso. The previous AT qso was a real challenge for Vern due to my weak signal and QRN. This was a great location! I worked a number of guys in Nevada, Colorado, and Missouri before having to pack up and get back to Eugene. Everyone complimented the “strong” QRP signal! Just what every QRP operator wants to hear!! 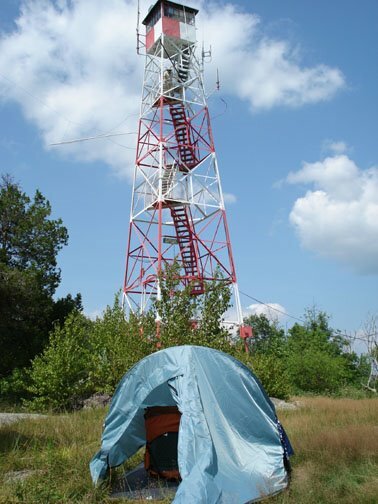 I plan to revisit this site in August, perhaps for a campover and more QRP field operating. And certainly I had thoughts that this would be an IDEAL Field Day site!! Hhmmmm….more planning and opportunites! !